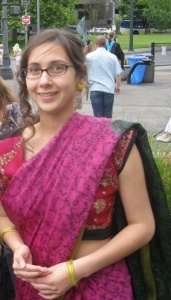 As a Westerner, it took me some time to learn how to wear a sari. There is a sort of grace that comes with wearing this elegant garment. There are a variety of ways to wear the sari and there is many a blog (or youtube video) to tell you and show you how. But I want to spend this time to talk to you about the three ways that I generally wear my sari, and most often seen them worn in films. Varanasi was the first place I did my shopping and bout my first sari. It was a forest green with orange red and yellow embroidered flowers. On sort of a whim, I went to India for the first time with two friends from high school. This week is Diwali, which means I go to Indian sweets and spices in Beaverton to get sweets for my Diwali feast. From the left, the brown balls are gulab jamun, coconut gulab jamun, carrot halwa burfi and cashew burfi. The middle is a rosewater ladoo. As a western traveler of North and South India, I feel that the sweets are pretty uniform, meaning you can often get any kind of sweet anywhere in India. Hello, this first post is going to be mostly about me, because I have quite an interesting story of the way I became interested in Indian culture. I actually got this at a bead store in Portland, Oregon. There is always a basket of vintage saris to look through. This story goes all the way back to when I was a little girl, starting to attend kindergarten at the International School of Amsterdam. I made friends with people from all over the world, including an Indian family that my mum was good friends with. The mothers cooked together and exchanged recipes. And the children and I would always play together. While tasting some new aloo (potato) recipes and learning about Diwali (Indian festival) at school, my interest in Indian culture only grew when my mum’s friend was cleaning out her jewelry one day. She gave me some earrings and bangles and I thought they were the most beautiful jewelry I had ever seen. I was further rewarded when my younger sister’s teacher, also from India, brought back a huge selection of bangles for my sisters and I. Little did I know, in December 2008, I would randomly go to India with two other friends. Though it was a huge cultural adjustment, by the end, India became my favorite country for many reasons, but most notably the jewelry, clothing and food. I recently took my own trip to South India for four and a half months, scouting out the best sari places, designing my own sari blouses and conferring with tailors in Hindi. Hopefully there will be another India trip in the works soon so I can fill out my bridal wardrobe. I will be posting on saris I like, saree stores I recommend, and accessories to go with your saris. I know I am a Westerner and have a different view on saris, but I have taken the time to understand the art of wearing a sari. I am also always learning about this intriguing garment!